John Coyne's plein air watercolor painting of the Manor House. Over the years, the Graylyn Estate has served Winston-Salem in many capacities, but this past Saturday, it provided a setting for a plein air painting session for University of North Carolina School of the Arts students. John Coyne, Director of Scene Design in the School of Design and Production, has been bringing his students to Graylyn for the past several years. A Plein Air Session is an outdoor painting session derived from the French expression “en plein air” meaning “in the open air.” In Coyne’s class, scenic design and scenic painting students work in watercolor to learn to observe light and quickly capture its ever-changing and ephemeral qualities on buildings and landscapes. 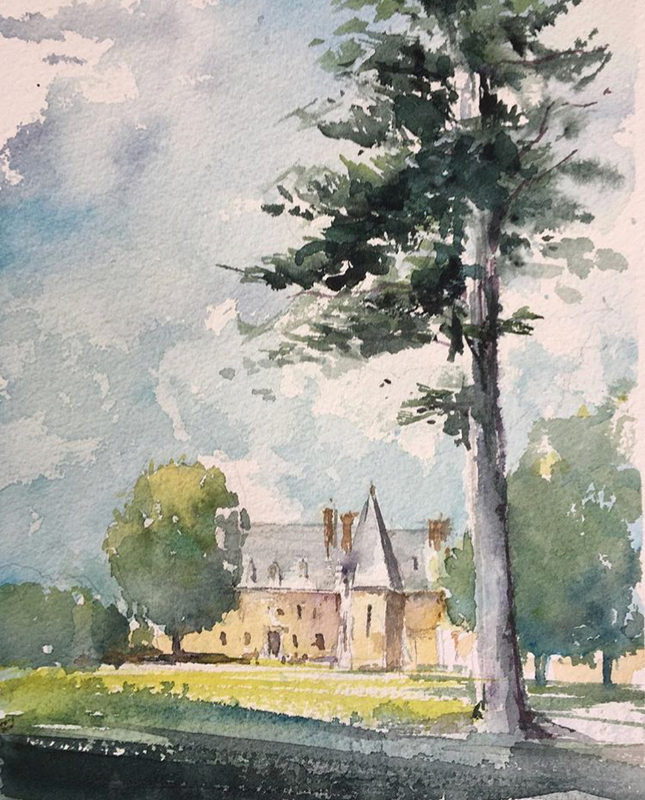 “With it’s beautiful trees, lawns and architecture, we love coming to Graylyn as there are wonderful scenes to paint in almost every direction you look,” says Coyne. Graylyn’s Executive Chef, Greg Rollins was named the “fan favorite” in the 9th annual Dr. Brownstone’s Sweet Summer Luv Luv Festival presented by Spring House Restaurant, Kitchen & Bar last Tuesday, August 15. Nearly 100 people attended and voted on the cuisines that were presented during the “culinary walkabout.” Chef’s Summer Vegetable Curry Stew, Green Tomato Chutney, Caribbean Rice and Peas, and Hibiscus Jerk BBQ Pork Shanks were enjoyed by many guests. The festival was a collaborative chefs dinner featuring Jeff Bacon of Providence Restaurant, Chris Fulk of Quanto Basta, Mark Grohman of Meridian Restaurant, Tina Hodges of Quanto Basta, Mark Little of Bib’s Downtown, Shane Moore of Foothills Brewing, Travis Myers of Willow’s Bistro, Jared Tipton of Spring House, John Wilson of Sophie’s Cork & Ale, and our very own Chef Greg Rollins. Fall is just around the corner, and Chef Rollins has created a seasonal appetizer that will satisfy most any palate. The best part? 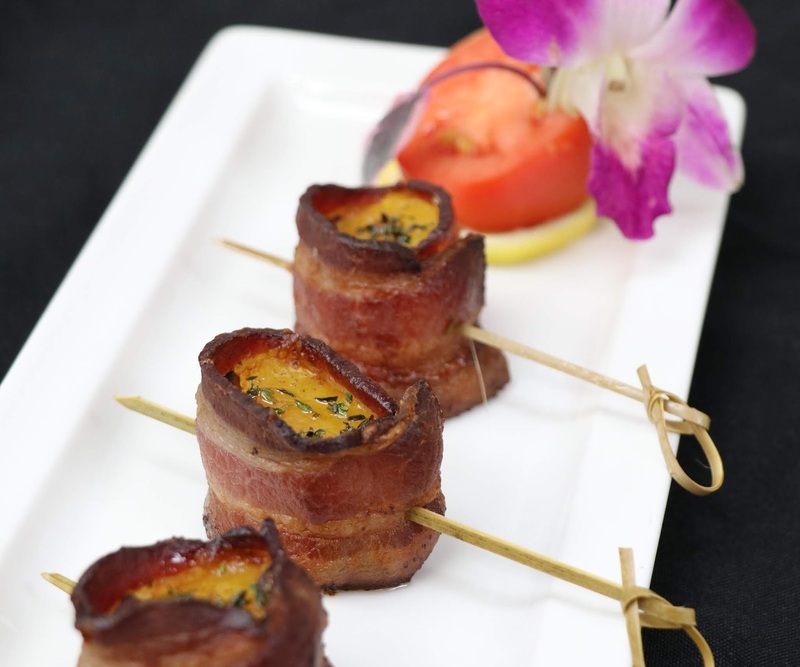 Chef has shared the recipe with us so you can make them for your next party, dinner, or just a night in. Preheat oven to 350F. Peel the butternut squash, cut the heads off with seeds and use later for soup. Cut the long solid squash lengthwise into half, and then half into quarters. Then cut each quarter in half and then half again. You’ll wind up with 32 bites. Melt butter over low-heat and stir in chipotle powder and sea salt. Toss the squash in the spiced, melted butter to coat. Cut the bacon slices in half, so you have 32 mini-slices of bacon. Wrap each butternut squash bite with a half slice of bacon, and use a toothpick to hold the bacon in place. Place on a baking sheet pan and bake for 45 minutes, turning once about halfway through. You know they are done when the bacon is crispy and the squash is fork-tender. Remove from heat, drizzle with maple syrup, and let cool before serving. These bites can also be served with honey mustard dipping sauce instead of maple syrup.